UEW does not manufacture but supply Heavy Duty rugged 18", 24", 36", 48"RIDGID Pipe Wrench and Heavy duty RIDGID Chain Wrenches for diamond core drilling , water well drilling, tubewell drilling etc. Spares like heel jaws and hook jaws are also provided. 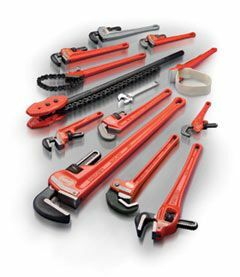 UEW can supply Indian make as well as RIDGID-USA Make Heavy Duty Pipe wrenches and Heavy Duty Chain Wrenches.